Mid-frenzy and flanked by powerful light during Sunday morning’s sunrise shoot I broke rank, disengaged camera from tripod, and went handheld to make some more spontaneous frames of my immediate surroundings. Rich golden light was pouring in from the northeast, and I wanted more than anything to capture the vibrant strength of the sun’s first light. Stronger than usual, just as I was experiencing it. The signs seen here sit right at my go-to Dock Road photo spot. 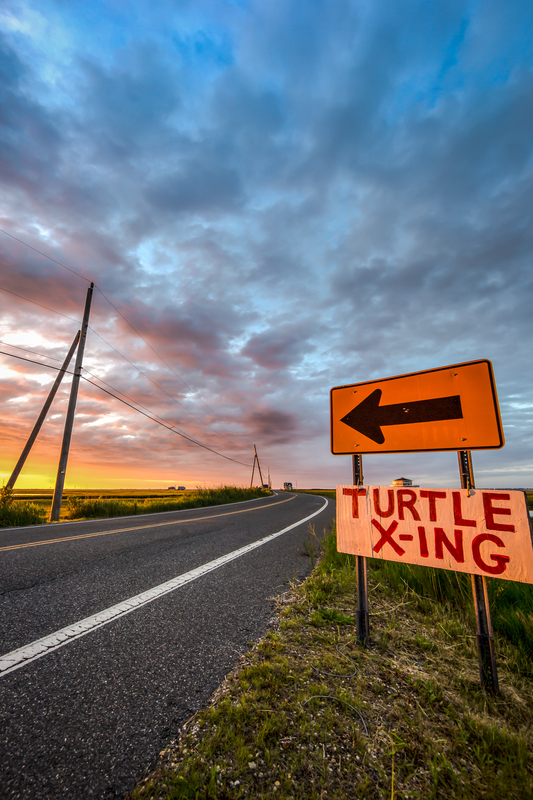 They always draw my attention—especially the quirky homemade TURTLE X-ING sign. It gets serious points for character, and the turtles need our vigilance! Since I’m almost always at the spot for sunset, the change in light source direction illuminated the signs in a way I just don’t get to see on the regular. Enchanted, I kept creeping closer and closer and closer with my wide angle lens—bringing the scene tighter and tight together. I’m pleased with this vertical orientation photograph. I’m particularly pleased with the signage pointing off to all the sunrise light drama happening to the northeast (left) side of the photograph.